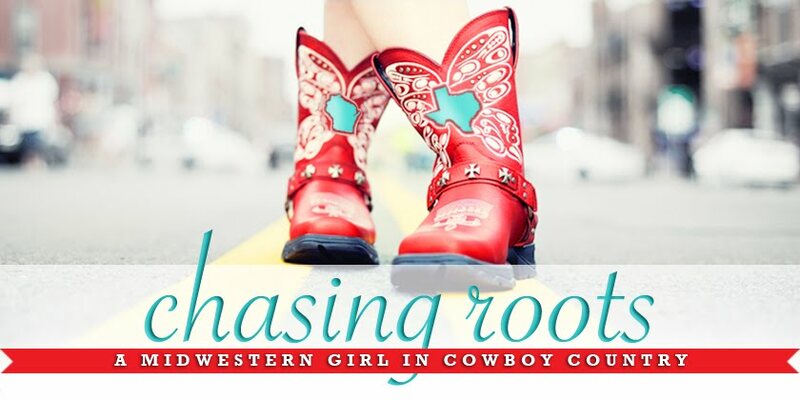 Chasing Roots: "Their Legacy Stands Firm and Their Memories Burn Bright." "Their Legacy Stands Firm and Their Memories Burn Bright." We have regularly visited Veterans Park for nearly five years, however I knew the park only for its athletic fields, pavilion (with stage), and playground. 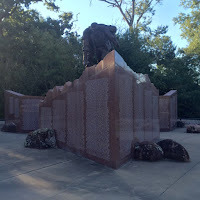 It wasn't until earlier this fall when, after dropping Will off for soccer practice, I decided to further explore and realized the obvious: Veterans Park and the Brazos Valley Veterans Memorial, nestled among the trees and along the Lynn Stuart Pathway, exist to honor and memorialize America's veterans. 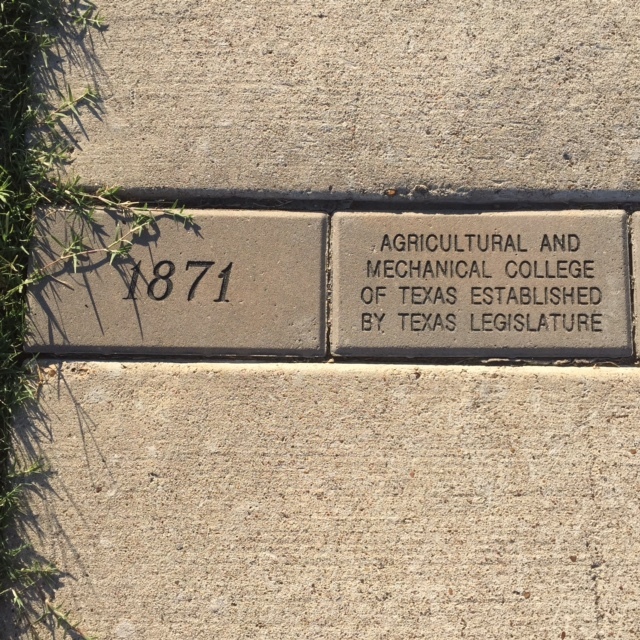 I began by walking "The American Mile: 240 Years of History", which begins near the park's pavilion and eventually connects to the Lynn Stuart Pathway. This uniquely walkable history lesson offers visitors a glimpse into the important events that occurred locally, nationally, and internationally every year starting in 1776. 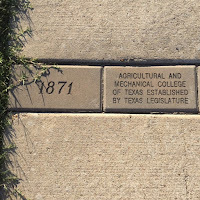 I followed the American Mile Historical Walk to the half-mile trail known as the Lynn Stuart Pathway, named in honor of Brigadier General Louis Lynn Stuart, without whose support and leadership the Brazos Valley Veterans Memorial may not have come to fruition. 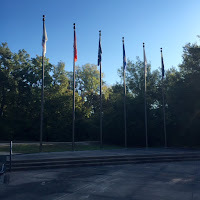 The pathway leads visitors through the history of the 17 major wars - beginning with the American Revolution, continuing through the Global War on Terror, and including the War for Texas Independence - fought by the United States. 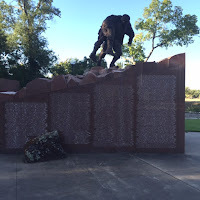 Situated along the path are historically correct bronze statues of veterans, interpretive panels providing information about each military conflict, and identifying markers. I had been jogging along the winding pathway, pausing the take pictures but quickly returning to my brisker pace. It wasn't until I rounded a corner and the woods parted to reveal the Louis L. Adam Memorial Plaza that I stopped in my tracks, immediately struck by the overwhelming reverence filling the space. The plaza centers around a bronze sculpture mounted on a massive, 250-ton Texas granite base, and the Wall of Honor lists the names of more than 4,800 United States veterans, including 24 Presidents and seven TAMU alumni who have received the Medal of Honor. 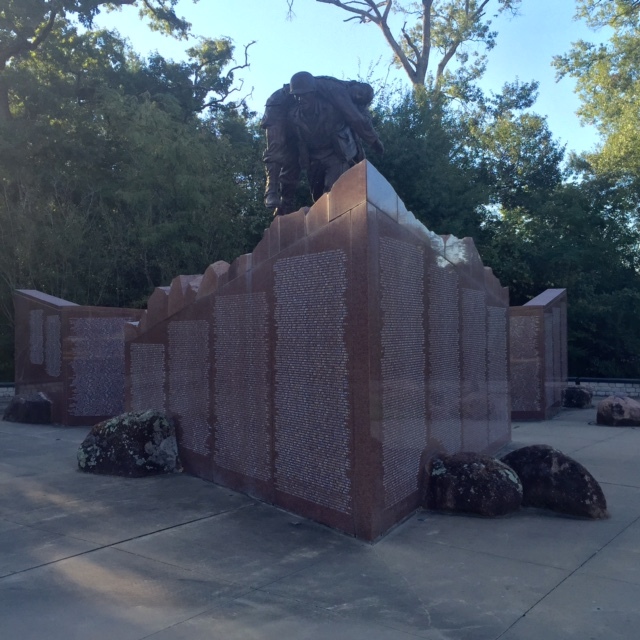 The Veterans Memorial sculpture was designed by Robert Eccleston, a former Army Ranger and a Captain in the 10th Mountain Division. The Louis L. Adam plaza was named in honor of Louis L. Adam, a US Army veteran and the father of Don Adam, who, as Chairman of The Adam Corporation, gave a major gift in support of the project. I'm thankful to have discovered the true meaning behind, as well as the history lessons and memorials associated with, this College Station park, and I'm grateful for the opportunity to share them with you today, on Veterans' Day. Today and every day, I extend my sincerest thanks to all the men and women who have served or are currently serving our country as members of the United States Armed Forces. 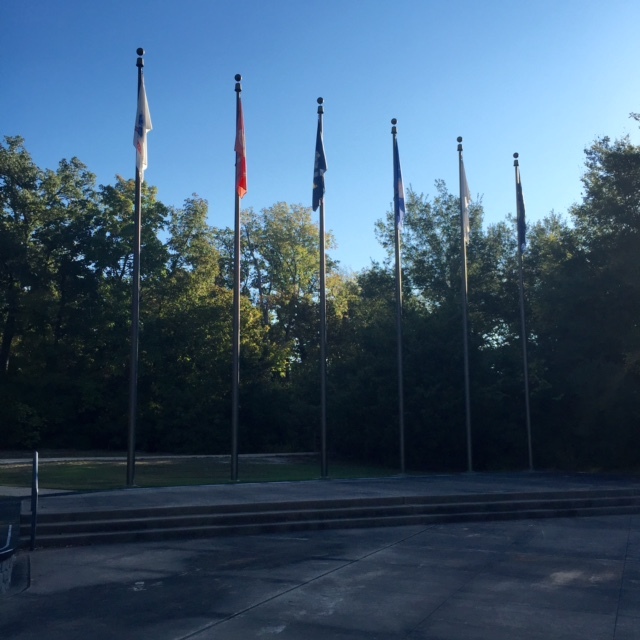 “The names that mark the Brazos Valley Veterans Memorial showcase the sons and daughters who gave dedicated service to our nation, so that future generations can share the freedoms we enjoy. Their task was great and their sacrifice even greater, but their legacy stands firm and their memories burn bright." ~ Former President George H.W. Bush at the Brazos Valley Veterans Memorial dedication in 2002.